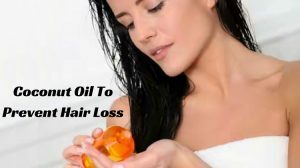 How To Use Coconut Oil To Prevent Hair Loss? As per American Academy of Dermatology, losing 50 – 100 hairs per day is considered normal. But if has exceeding the limit and shedding abnormally then it becomes a matter of concern (1). Hair loss can be caused due to several reasons like stress, vitamin deficiency, hormonal changes, heredity, poor nutrition or any underlying medical conditions. There are different types of hair loss like male-pattern baldness, female pattern baldness, anagen effluvium, telogen efflium and alopecia aretra. Whichever pattern of hair loss you are experiencing, it can be controlled or completely treated by following proper diet, reducing stress and changing lifestyle habits. This may take some time to show you results. So, in the meanwhile you can try natural remedies to control the hair loss and encourage new hair growth. Out of all those ingredients that are beneficial for hair loss, coconut oil is my favorite choice. It is an umbrella of good things that nourish your hair and prevent hair loss. Does Coconut Oil Help With Hair Loss? Coconut oil is rich in antioxidants and nutrients like vitamin E, vitamin K and iron that nourish the damaged hair follicles and strengthens them. Coconut oil is known for its hair penetration ability. So, massaging with coconut oil improves blood circulation to the hair follicles which in turn stimulates hair re-growth. The antiviral, antifungal and antibacterial properties of coconut oil help fight scalp infections which can cause hair loss. The lauric acid present in coconut oil binds to the hair proteins and prevents the hair strands from breakage. Coconut oil can be used directly or coupled with other oils/ingredients to prevent hair loss. Out of all those are available, the best and most effective ones are listed below. When massaged, coconut oil tends to penetrate the hair follicles and remove any blockages or clogs. This enables the free flow of blood thus boosting the blood circulation to the hair follicles. Slightly warm 2 tablespoons of coconut oil. Apply it all over your scalp and hair from root to tip. Now massage your head gently with your fingertips for about 5 minutes. Wrap a towel around your head and leave it alone for an hour. Shower with a mild shampoo. Repeat this process 3 times a week. Castor oil consists of omega-9 fatty acids and Ricinoleic amino acids which are the most essential requirements for a well-nourished scalp. They penetrate the hair follicles, free up the blood circulation, enable better nourishment to the existing follicles and promote the growth of new hair. Mix equal parts of castor oil and coconut oil. (2 tablespoons each or increase it depending on the length of your hair). Apply it onto your scalp and start massaging gently for about 5 minutes. Wrap a towel or a shower cap to your head and leave it on for a few hours. Wash your hair with a shampoo. Curry leaves are rich in antioxidants, beta carotene and amino acids. They help in reducing the hair fall, repairing the roots and in promoting hair regrowth. Curry leaves further rejuvenate the hair follicles and prevent premature greying of hair. Heat a frying pan and pour 3-4 tablespoons of coconut oil. Add a handful of curry leaves (wash and dry) into the oil and fry them. Once the leaves turn black, switch off the stove and strain the oil. Let the oil cool down and apply it to your scalp. Massage gently for 5 minutes and leave it on for a few hours. Repeat this process 1-2 times a week for better results. Hair loss can also be caused due to scalp infections or pollution. Camphor helps fight these infection causing bacteria. It also protects your hair from pollution and promotes hair growth too. Crush a few camphor blocks (enough to fill 2 teaspoons). Mildly heat half a cup of coconut oil in a saucepan. Now add the camphor powder to the oil and stir till it dissolves. Remove the solution from the stove and let it cool. Apply the oil solution to your scalp and hair thoroughly. Massage for 5-10 minutes before washing it off with a shampoo. Repeat the process once a week. Lemons are rich in vitamin C, magnesium, and calcium. The Limonene present in it helps cleanse the hair of any dirt, dandruff or infection causing bacteria/fungi. It also protects the hair follicles from breakage. Squeeze one ripe lemon into a small bowl and mix it with 2-3 tablespoons of coconut oil. Apply the mixture to your scalp and hair thoroughly. Massage for a few minutes before sealing it with a shower cap. Wash your hair with cool water and a mild shampoo the next day. Eggs contain essential minerals like zinc, iodine, potassium and selenium which nourish, strengthen your hair and prevent them from falling off. Being natural conditioners due to the presence of lecithin, eggs help in reducing frizzy hair. Beat a large egg into a bowl. Add 1 tablespoon each of coconut oil and honey to the beaten egg. Whisk thoroughly and gently apply it to your scalp and hair. Cover it with a shower cap and leave it for a few hours. Rinse your hair with cool water and a shampoo. Note: Your hair might be a bit smelly after the application of this hair pack. Use an aromatic shampoo or simply add lemon to your bath water to get rid of the smell. The linoleic acid found in Ginger nourishes and strengthens the hair follicles. Ginger root contains magnesium, phosphorus, potassium, vitamins which makes it a great anti-dandruff and natural conditioner. Grind some ginger into a fine paste. Squeeze out the juice into a small spoon. Mix this with 2-3 tablespoons of coconut oil. Apply this to your scalp and massage gently for about 5 minutes. Let your hair sit with this for 2-3 hours before showering with a shampoo. Repeat every other week for best results. Sulfur deficiency has been linked to hair loss. Methylsulfonylmethane, an abundant source of sulfur is found in onions which results in the formation of keratin, an essential component for hair growth (2). Take 1 tablespoon of onion juice and mix it with 2 tablespoons of coconut oil. Apply this to your scalp and hair follicles. Massage for about 5 minutes and let it sit for about an hour. Repeat once a week or once every other week is enough. Garlic has high calcium, zinc, sulfur and vitamin C content in it. The selenium present in garlic helps with improved blood circulation, prevention of clogging pores and thus aids in the reduction of hair fall. Crush about 10-12 cloves of garlic and squeeze the juice into a small saucepan. Add 2-3 tablespoons of coconut oil to it and heat the mixture. Let the concoction cool down before applying it to your hair. Massage gently for about 5 minutes and let the hair sit for a while. Rinse off with cool water and shampoo. Repeat 1-2 times every week. Aloe Vera consists of proteolytic enzymes which repair the skin cells on the scalp to promote healthy hair. Aloe Vera not only conditions your hair, but also has a chemical make-up similar to that of keratin which promotes in hair growth. Mix equal parts of coconut oil and Aloe Vera. Cook the mixture on low flame for about 30 minutes. Remove from the flame and let it come to room temperature. Apply it to your hair and scalp as a pack. Leave it on for as long as you can. Wash off with cool water and shampoo. Repeat this process once every 2 weeks. Apple cider vinegar cleanses your hair and maintains the pH levels of the scalp. Its anti-fungal and anti-bacterial properties prevent any infections and protect the hair from falling. Take 2 tablespoons of coconut oil, 1 tablespoon of ACV and 1 tablespoon of honey. Mix them well and apply it to your hair. Amla is known for its high carotene content which helps keep the hair lustrous and healthy. It’s rich vitamin C content helps keep the hair dust and dandruff free. Also, Amla enhances the hair color, strengthens and conditions it. Take about 8-10 Indian gooseberries and slice them to little pieces. Dry these for about 2-3 days under sun. Now take a saucepan and fry the dried amlas in a cup of coconut oil. Once the concoction turns black in color, take it down from the stove. Now cool it and apply to your hair as a pack. Wrap it with a shower cap and let it stay for an hour before showering off with a mild shampoo. Little amounts of this tonic on your hair daily will result in a lustrous and healthy hair. Both coconut oil and olive oil are great moisturizers. Olive oil contains anti-oxidants which help fight infection causing bacteria and fungi. When coupled with coconut oil, your hair can be protected against dryness and flaking. Mix equal ratios of coconut and olive oil in a small bowl. Apply it to the hair follicles and scalp thoroughly. Massage gently for about 5 minutes. Hibiscus fights hair fall and prevents premature greying of hair and split ends. It strengthens the hair follicles, conditions them and gives a bouncy feel to the hair (3). Take a frying pan and pour 1 cup of coconut oil into it. Heat it mildly and add about 10-12 fresh hibiscus leaves. Fry them till they become golden red in color. Strain the oil and let it cool down. Apply this to your hair 2-3 times a day as a conditioner or as a simple massage hair oil. Honey is a natural moisturizer for the scalp. It has strong antioxidants which keep away infections from the scalp. Mix a tablespoon of honey and 2 tablespoons of coconut oil. Apply this mixture to your scalp evenly and cover it with a shower cap. Leave it for an hour and then shower with a mild shampoo. Cayenne pepper consists capsaicin and vitamin B6 which both enable hair growth. Potassium and vitamin K help moisturize and keep the hair from drying up. Cannabinoids are compounds usually found in marijuana which prevent hair from growing. Cayenne pepper is a natural cannabinoid blocker. It stops cannabinoids from reaching the endocannabinoid receptors which are responsible for hair growth among other functions. Into a jar, add ½ cup of coconut oil and mix 2 tablespoons of cayenne pepper. Stir well, seal the jar and keep it aside in a cool and dark place for about 2 weeks. Now take it out and add ½ cup of olive oil to the mixture. Apply some of the infused oil to your scalp and massage properly. Wash off after an hour. Repeat 2 times a week. Fenugreek consists of proteins which help to fight baldness. Its potassium content helps to prevent grey hair. The Lecithin in it strengthens the hair follicle whereas the nicotinic acid in it promotes hair growth. A handful or a cup of fenugreek seeds must be soaked overnight. Strain them and crush to obtain a paste of fenugreek seeds. Add about 2 tablespoons of coconut oil to this paste and mix thoroughly. Apply this to the scalp and massage gently with your fingers. Leave this on for an hour. Wash the hair with cool water and a mild shampoo. Repeat this 2-3 times a week. Almond oil consists of magnesium, calcium, zinc, omega-3 acids, vitamin E and phospholipids among other important and vital components which are essential for a healthy, strong and dandruff free hair. Mix 1 tablespoon of almond oil with 1 tablespoon of coconut oil. Wet your hair and then apply. Gently massage your scalp for about 5 minutes. Let it sit for about 30 minutes before washing it off with a mild shampoo. Emu oil is known to awaken about 80% of the sleeping hair follicles. Derived from the back fat of the Emu bird, Emu oil is known for its penetration abilities which help in spreading medication/oils that are applied to the scalp. Use regularly after a shower or head bath. Vitamin E is an anti-oxidant which helps to repair and rebuild the skin tissue. When applied to the scalp, vitamin E showcases anti-inflammatory properties and repairs the broken and damaged follicles, promoting a healthy hair follicle growth. Break open 2 Vitamin E capsules and add its contents to 2 tablespoons of lukewarm coconut oil. Mix well and apply to your scalp. Massage gently using your fingers for about 5 minutes. Leave it on for about 1 hour and then wash it off with mild shampoo. Essential oils are volatile aromatic compounds which are extracted from various parts of different plants. A few essential oils like Lavender, Rosemary and Tea Tree, when coupled with coconut oil work incredibly against hair fall. Lavender is considered to be the best cure for alopecia (hair fall in patches). Lavender oil is used in aromatherapy to reduce hair fall due to stress and anxiety. It also helps treat dandruff and is an excellent hair conditioner. Rosemary essential oil stimulates cell division and dilates the blood vessels of the scalp that promotes the hair follicles to induce new hair growth. It also strengthens the hair follicles, prevents dandruff, moisturizes the dry hair and reduces split ends. Tea Tree oil can soothe and reduce the dry flaking of the scalp. It is known to remove the dead skin cells, fungi and bacteria from the scalp. It is also known to fight dandruff, psoriasis and seborrheic dermatitis. Add about 5-8 drops of essential oil into 2 tablespoons of coconut oil. Mix well and apply it to your scalp and hair. Massage gently and wrap a towel or shower cap to your head. Leave it for 1-2 hours before you shower. Repeat once every 2 days for better results. Add coconut oil to your diet or use it for cooking. Its nutritional composition makes it a better cooking oil than others. Try to stay away from pollution. If avoiding pollution is not possible, make sure that you properly cover your hair and protect it from getting polluted. Avoid any extreme or harsh chemical shampoos as they can worsen the hair condition. Avoid using hair styling tools as they make your hair brittle. Do not rub or tug your wet hair with a towel. Cool air-dry it. Avoid combing your hair when it is wet. Eat a balanced diet and exercise regularly. Reduce and always maintain your stress and anxiety levels. Pure coconut oil should i warm and add 2 capsule of vitamin e keep on head over night abd wash next day. Is it stop hair fall?